https://sep.yimg.com/ay/yhst-33477391359232/velvet-coral-assorted-color-montipora-species-montipora-plate-coral-velvet-finger-coral-9.jpgVelvet Coral - Assorted Color - Montipora species - Montipora Plate Coral - Velvet Finger CoralModeratePeacefulYesCalcium, Strontium, Trace elementsIndo-PacifcAcroporidaeSmall 2" - 3"
Velvet Coral - Montipora species: As the name suggests, Velvet Coral resembles the appearance of velvet, owing to the tiny polyps covering the surface of coral. Very diverse and interesting in appearance due to its varied patterns and colors, Velvet Coral yields a striking look to your marine aquarium. Velvet Coral encrusts the rocks in your reef tank giving your aquarium a filling look. The coral can also live peacefully near to the other peaceful corals in your reef tank. Velvet Coral is quite hardy and is moderately easy to maintain and can therefore be attempted by the beginners as well. Your marine aquarium however, should be mature. This article briefs you about the various aspects of Velvet Coral. The information may be handy with regards to the coral�s maintenance in your marine aquarium. Taxonomy: Velvet Coral belongs to the Kingdom Animalia, Phylum Cnidaria, Class Anthozoa, Family Acroporidae and Genus Montipora. Scientific names: The scientific name of Velvet Coral is Montipora species. Some specific names of some of the common varieties of Velvet Coral are Montipora digitata, Montipora stellata and Montipora nodosa. Other common names: Velvet Coral is also commonly known as Cabbage Coral, Montipora Encrusting Coral, Lettuce Coral, Velvet Branch Coral, Velvet Finger Coral and Velvet Rock Coral. Coral Type: Velvet Coral is a Small Polyp Stony (SPS) Coral. Origin or natural range: Velvet Coral originates from the Indo � Pacific region, the Western Pacific region and the Great Barrier Reef. Color: The Montipora species occurs in purple, blue, cream and brown colors. Compatibility: Velvet Coral is non-aggressive towards the other marine aquarium invertebrates. The Montipora species is an encrusting coral. Velvet Coral is found in the shallow regions of the marine water body it inhabits. The skeleton of the Montipora species is hard, branched and spiked. All together, the coral resembles the shape of a mountain. Generally, Velvet Coral has irregular plate shaped structures while, some varieties of the coral are shaped like a vase. The surface of the Montipora species has numerous tiny polyps which on an overview give a fuzzy look to the coral�s body surface just like velvet. Water flow in the aquarium: Velvet Coral needs average water movement in the marine aquarium it abodes. The Montipora species requires moderate lighting in the marine aquarium hosting it, but keep the coral in low light initially then slowly graduate it to the higher intensity of lighting else the Velvet Coral will get bleached. Actinic lighting is recommended for the Montipora species. Power Compact, VHO and Halides lightings are also fine. 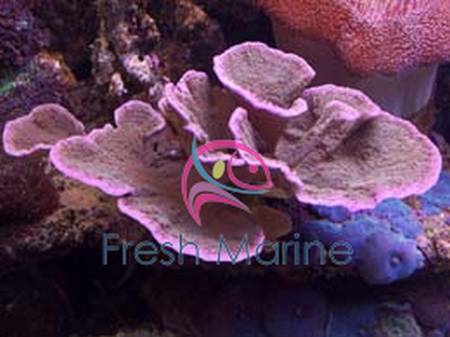 Place Velvet Coral anywhere in your established marine aquarium. You can keep the Montipora species near to the other peaceful corals in your marine aquarium. Velvet Coral grows easily and rapidly encrusting the rocks in your reef aquarium, if it gets amenable atmosphere therein. The Montipora species derives its nutrition mainly through photosynthesis, which is performed by zooxanthellae, a photosynthetic alga living symbiotically within the coral. Velvet Coral is Planktivorous in feeding habit and filter feeds a few times per week, when open. The Montipora species eats acellular marine invertebrates, phytoplankton and zooplankton. Add Calcium, Strontium and trace elements to the water as dietary supplements for the Montipora species. Breeding: Velvet Coral grows rapidly and easily in a marine aquarium. The Montipora species needs moderate care. Keep Velvet Coral in dim light initially and after the coral adjusts to the lighting, move it to a higher light intensity.